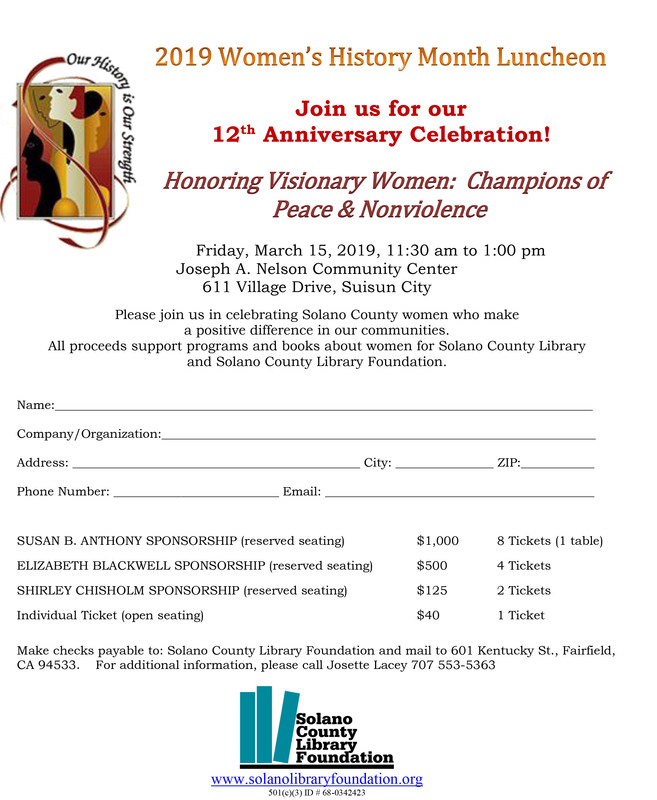 The theme for 2019 is "Visionary Women: Champions of Peace & Nonviolence." This year we honor women who have led efforts to end war, violence, and injustice and pioneered the use of nonviolence to change society. These Honorees embraced the fact that the means determine the ends and so developed nonviolent methods to ensure just and peaceful results. For generations, women have resolved conflicts in their homes, schools, and communities. They have rejected violence as counterproductive and stressed the need to restore respect, establish justice, and reduce the causes of conflict as the surest way to peace. From legal defense and public education to direct action and civil disobedience, women have expanded the American tradition of using inclusive, democratic and active means to reduce violence, achieve peace, and promote the common good. The Nomination Process Woman of the Year Nominations are solicited by the Solano County Women's History Month Luncheon Committee. The nominations are reviewed and decided by a selection committee. Please use the Nomination Form below. For more information, please call 707-553-5363. - Live in Solano County. - Are available to participate in the luncheon on March 15, 2019. - Have played an integral part in the development and/or implementation of project(s) or commerce that have benefited Solano County. - Are not current Library employees, current elected officials or Solano County Library Foundation Board members. - Respond to all questions. - Keep the selection criteria and this year's theme in mind and address them when answering the questions. - Keep answers short, concise, and clear. - Tell the nominee's story as if you were telling a stranger. The Selection Committee may not know the nominee. - Please use (only) the space provided for your answers. - The Honoree will be announced by February 19, 2019. - ALL nominees who attend the luncheon will be recognized.